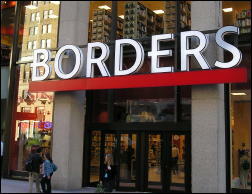 Borders Bankruptcy Filing Next Week? Late yesterday Bloomberg reported that Borders Group plans to file for bankruptcy protection as soon as next week and will likely close at least 150 stores, "according to three people familiar with the matter." As a result, Borders stock plummeted 36%, to 47 cents a share, a 52-week low and near its historical low in late 2008 during the financial meltdown. Volume yesterday was three times the usual. The company's market capitalization is just under $34 million. At the same time, Barnes & Noble rose 7.4%, to $16.92. Bloomberg also said that "several private equity groups are weighing whether to provide a junior loan" to Borders. 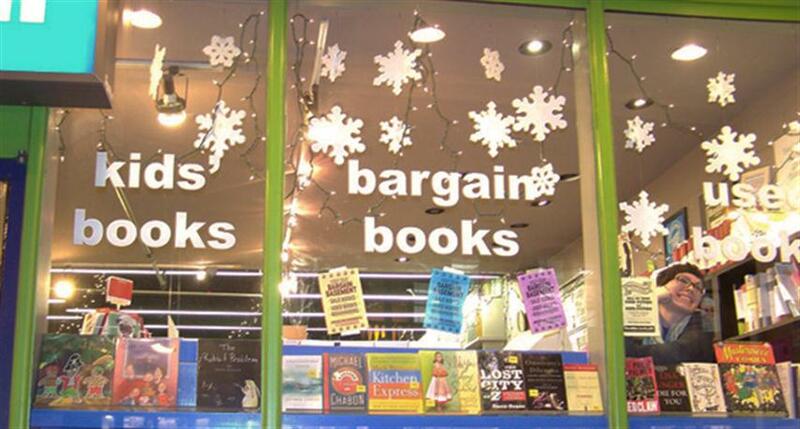 This past Sunday Borders announced that it is delaying January payments to "certain parties--vendors, landlords and others" (Shelf Awareness, January 31, 2011). It has also said it is considering "in-court restructuring," i.e. bankruptcy. Borders has some 19,500 employees in slightly more than 500 superstores and about 165 smaller stores, mostly in malls and airports. Books & Books plans to open its eighth location--the Newsstand Café by Books & Books--at the redesigned plaza of the Wachovia Financial Center in downtown Miami sometime between mid-February and early March. The Miami Herald reported that the store "will have 800 square feet inside, plus outdoor seating in the plaza. The opening will fill a long-awaited need for a bookstore in Miami's urban core." Books & Books has expanded steadily in the last few years, opening bookshops in the Cayman Islands and Westhampton Beach, N.Y. More recently, plans were announced for its first Broward County location, in Fort Lauderdale. Apple responded to claims it is altering the App Store's policy in ways that could affect Kindle, Nook and Sony Reader apps (Shelf Awareness, February 1, 2011) by contending "it has not changed any of its guidelines given to developers, but it indirectly confirms that accessing content purchased elsewhere could be a no-no if that content isn’t also available to be purchased through Apple’s own system," Ars Technica reported. "We have not changed our developer terms or guidelines," said Apple spokesperson Trudy Muller. "We are now requiring that if an app offers customers the ability to purchase books outside of the app, that the same option is also available to customers from within the app with in-app purchase." Ars Technica noted, however, that while the company's policy isn't new--"Apple doesn't allow apps to sell content to users unless that content passes through the official Apple ecosystem, where Apple gets a 30% cut"--Muller's statement indicates the interpretation may have changed significantly: "If an app lets users access content that they purchased via Amazon's website, for example, then that same app must also let users buy the same book via Apple's own in-app purchase system. If the app developer doesn't want to use Apple's in-app purchases to sell content, then the app can't access content purchased elsewhere either. This is notable because it will require Amazon and Barnes & Noble (as well as Sony, whose iOS app is not yet available) to change how their offerings work. 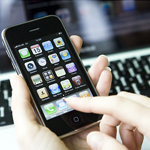 Apple wants its 30% share of content sales whenever possible." While he admits that deciding "which of two closed platforms is more 'evil' is a mug's game," Slate's Farhad Manjoo hopes Amazon "responds to Apple's restriction by voluntarily pulling the Kindle app from the App Store. 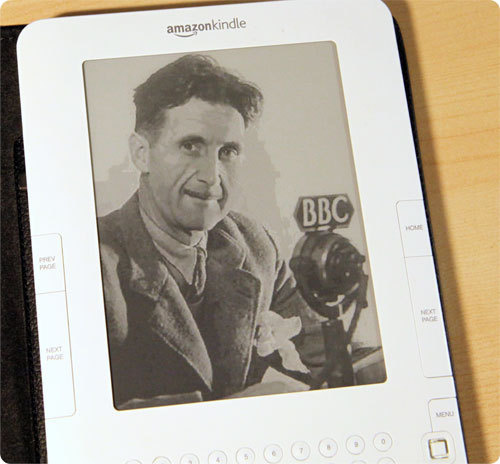 In its place, Amazon should create a Kindle reader for the mobile Web--a fully functional e-book app that Apple couldn't meddle with.... Building this app shouldn't be too hard; Amazon has already created a Kindle reader for full Web browsers. What's more, because the mobile Web is pretty consistent across all kinds of devices, the mobile Web edition of the Kindle would work not just on the iPhone, iPad, and iPod Touch, but also on Android, Palm, BlackBerry, and Windows phones and tablets." The Independent Book Publishers Association and Ingram Content Group have launched a program under which IBPA's more than 3,000 members have options to list titles on Ingram's iPage and to have books printed on demand through Lightning Source and delivered to Ingram's worldwide customer network. IBPA president Florrie Binford Kichler commented: "This agreement will allow all of our publishers to take advantage of Ingram's distribution and marketing reach, giving small and independent publishers options to access Ingram Content Group's U.S. retail, international, and library customers. Having books available through Ingram significantly levels the playing field for our publishers." Publishing Trends explored the various processes currently being employed by the New York Times, the Bookseller and others to create e-book bestseller lists in response to the rapid growth of this market, and compiled "a rudimentary e-book bestseller list" of its own: "The bestseller lists we looked at (from Kindle, Nook, Apple’s iBookstore, Sony Reader, and Kobo) were quite varied, and estimating market share was difficult. For now, though, we’re proud to say we beat the New York Times in publishing an e-book bestseller list." Microcosm Publishing has been running a swap-your-Kindle-for-our-books campaign recently at its Portland, Ore., retail store. "There's a little bit of pressure to buy these devices," store manager Rio Sasari told International Business Times. "It's pushed very well, and people feel the need to conform a bit and keep up with trends. There are people that feel that pressure, but they just want books." Thus far, three people have opted for the trade-in offer. 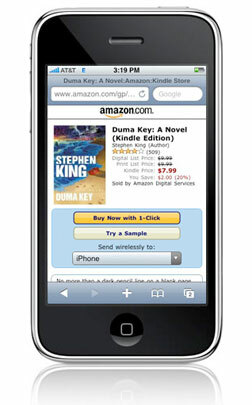 Sasari added that the idea was not hatched as an anti-e-book promotion: "We don't have anything against the technology. We're just trying to make a positive statement for books. We're just pushing books as something cool, hip and new.... Print as empowering medium. It's just nice to get people talking about it." Bad weather update of the day: In an e-mail to customers yesterday morning, Brookline Booksmith, Brookline, Mass., wrote: "This quick message is to confirm that tonight's reading with Caroline Leavitt is still scheduled. No snow day for literature!" 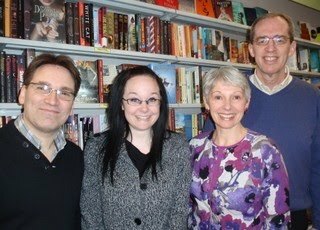 After 26 years, Chuck Erion and Tricia Siemens (at right), co-owners of Canadian indie Words Worth Books (Waterloo, Ontario), are retiring and have sold their business to long-time employees David Worsley and Mary Brouse, Quill & Quire reported. "It’s so exciting that this venture is a succession," said Brouse, adding, "We have a great framework and a good business model right now, so a lot of it will be very similar. Any newness will come along slowly." 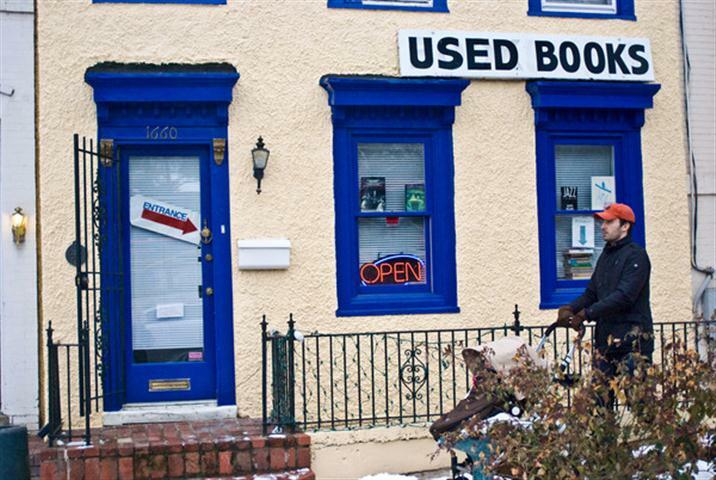 Georgetown Used Books, Washington, D.C., was profiled by the Georgetown Patch, which noted that the "well-stocked bookstore in upper Georgetown is definitely worth stopping by" and cited Rahm Emanuel, President Obama's former Chief of Staff, and former Secretary of State Madeleine Albright as examples of the shop's often high-profile customers. "We can't compete with the comfort of the Internet... but I think it's a good culture to have," said owner Hamid Afshar. "With the bookstore, people can come in and read a few pages and talk with each other. It's a community you can't find on Amazon." From the "it's always something" department: Cnet's David Carnoy wrote that how Kindle pages are numbered has been the subject of an ongoing debate: "[W]hen the original Kindle launched a few years back, Amazon decided to go with a new form of page numbering that breaks the book down into the aforementioned locations. At location 771-76 in the Kindle user Guide, locations are described as 'the digital answer to page numbers.' For the Kindle, 'locations' were designed to alleviate the problem of font-size selection changing the number of pages in a book." Carnoy observed that Amazon "could just give consumers a choice between actual page numbers and locations, font size be damned. But I have a feeling it knows that consumers would opt for the more familiar page number standard they're used to." Flavorwire celebrated authorial alter egos by featuring "Fictional Novels Starring Non-Fictional Authors" and noted that sometimes authors "infiltrate their own stories as characters named for themselves. Whether purely narcissistic or a tool of artistic commentary, the author-as-character literary technique lends an element of surrealism to the reading experience and draws attention to both the act of narration and the act of creation--as well as their shared unreliability." This week's literary mixtape from Flavorwire was made for Lewis Carroll's Alice, who is "not that old yet, so her taste is probably all over the place. Here are the songs we think Alice would explore, drink tea, and defy the Red Queen to." Complaints about the absence of Jefferson Airplane's "White Rabbit" can be directed to Flavorwire. Book trailer of the day: the reissue of The Journey Is the Destination (Chronicle), about Dan Eldon, the artist, adventurer and activist who died in 1993. This August, Chronicle is also publishing Safari as a Way of Life, an illustrated YA biography of Eldon. A movie about Eldon's life, produced by Julia Roberts's Red Om Films, is in the works. By the way, the editor of The Journey Is the Destination, which first appeared in 1997, was Annie Barrows, co-author of The Guernsey Literary and Potato Peel Pie Society and author of the Ivy and Bean series. Talk about a journey! Because of the wave of change sweeping Egypt, the publication date for the first book by Nobel laureate Mohamed ElBaradei, who has emerged as a leader of the movement against President Hosni Mubarek, will be moved up to April 26. Called The Age of Deception: Nuclear Diplomacy in Treacherous Times, the book is being published in the U.S. by Metropolitan Books and was originally scheduled to appear in June. 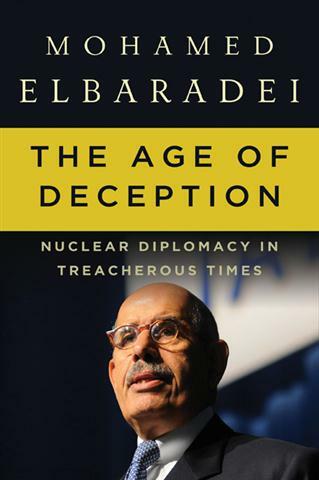 The Age of Deception is an account of ElBaradei's account of his three terms as the director general of the U.N.'s International Atomic Energy Agency, when, among other challenges, he argued in 2003 that Iraq did not have weapons of mass destruction--and was proved right--despite the Bush Administration's insistence otherwise. ElBaradei and the agency were awarded the Nobel Peace Prize in 2005. Sara Bershtel, publisher of Metropolitan Books, commented: "In Egypt this past week, Dr. ElBaradei has again shown the world his commitment to democracy, human dignity, and peace. His book reveals a long career of independent thought, integrity and courage--the qualities Dr. ElBaradei has displayed so dramatically over these last days." Other titles of interest about Egypt include the epic Cairo trilogy by Nobel literature laureate Naguib Mahfouz, which includes Palace Walk, Palace of Desire and Sugar Street. The tale is a kind of introduction to modern Egypt, tracing Cairo society from the early 1900s to the Revolution of 1952. Other important works by Mahfouz include Adrift on the Nile, which depicts corruption during the Nasser era, and Children of the Alley, a religious allegory that offended many in the Muslim world. All these titles are available from Anchor. The Yacoubian Building by Alaa Al Aswany is set in 1990 in a building in Cairo whose passionate, colorful inhabitants run the gamut of Egyptian society, available from Harper Perennial. The Man in the White Sharkskin Suit: A Jewish Family's Exodus from Old Cairo to the New World by Lucette Lagnado is a memoir by a Wall Street Journal reporter about her father, who was a successful businessman and investor in Cairo but emigrated in 1963 when life for Egyptian Jews became intolerable. The book won the 2008 Sami Rohr Prize for Jewish Literature. Also available from Harper Perennial. A new online event involving booksellers, publishers, authors, editors and agents aims to raise funds and awareness for the Red Cross and its work in communities across the country. The collaborative effort is modeled on the highly successful "Do the Write Thing for Nashville" fundraiser in 2010, which raised $74,000 in 10 days following last spring's devastating floods. Writers for the Red Cross will go live in mid-February, with active fund-raising running March 1-31 (March is Red Cross Month). Throughout that time, the group will auction off donated publishing-related items and services. The site will host guest posts from authors about "What the Red Cross Means to Me" and a daily countdown of "31 Things You Didn't Know About the Red Cross." All donors who give $25 or more will be able to select a free book from a range of titles provided by publishers for the event. Bookstores that make a donation to the Red Cross will be prominently featured on the site; stores can also participate in other ways: host an author event or choose a specific book, books, or genre to promote in March, with a percentage of sales earmarked for Writers for the Red Cross. Authors can donate signed copies of their books; publishers are asked to provide books as donor incentives; agents can offer a query/manuscript critique as an auction item. 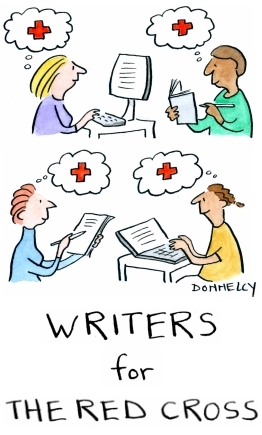 Check the Writers for the Red Cross site for other ways to participate. Anyone interested in helping can subscribe to the WFTRC blog, become a fan on Facebook, blog about it--spread the word in whatever way comes naturally. This morning on the Today Show: Len Berman, author of The Greatest Moments in Sports (Sourcebooks Jabberwocky, $16.99, 9781402220999). Tomorrow morning on Good Morning America: Andrea Buchanan, author of Live and Let Love: Notes from Extraordinary Women on the Layers, the Laughter, and the Litter of Love (Gallery, $24, 9781439191354). Tomorrow on the Martha Stewart Show: Grace Young, author of Stir-Frying to the Sky's Edge: The Ultimate Guide to Mastery, with Authentic Recipes and Stories (Simon & Schuster, $35, 9781416580577). Also on Martha Stewart: Maura Madden, author of Crafternoon: A Guide to Getting Artsy and Crafty with Your Friends All Year Long (Gallery, $16.95, 9781416954712). Jessica Pigza, rare books librarian at the New York Public Library, will appear with Madden. The pair run a series of crafting events at the library, and on the show they will design and make valentines using graphics from NYPL's collection. They previously led an event on the same topic for Martha Stewart Magazine. See the video here. Tomorrow on KCRW's Bookworm: Joseph McElroy, author of Night Soul and Other Stories (Dalkey Archive Press, $14.95, 9781564786029). Tomorrow on NPR's Talk of the Nation: Clarence Lusane, author of The Black History of the White House (City Lights Publishers, $19.95, 9780872865327). Tomorrow on PBS's NewsHour: Joyce Carol Oates, author of A Widow's Story (Ecco, $27.99, 9780062015532). Tomorrow night on the Colbert Report: Jane McGonigal, author of Reality Is Broken: Why Games Make Us Better and How They Can Change the World (Penguin Press, $26.95, 9781594202858). ABC Family greenlighted two book-related series, ordering 10 episodes--including the pilot--for each one, Deadline.com reported. The Great State of Georgia, which "centers on Georgia (Raven Symone), an exuberant curvy performer from the south, and her science geek best friend Jo (Majandra Delfino) who try to make headway in New York City," was written by novelist Jennifer Weiner and Jeff Greenstein (Desperate Housewives). Another series, Nine Lives, is adapted from Alloy Entertainment's Nine Lives of Chloe King series of three YA novels by Celia Thomson. Kristen Bell will star opposite Don Cheadle in Showtime's comedy pilot House of Lies, based on Martin Kihn's book House of Lies: How Management Consultants Steal Your Watch and Then Tell You the Time, Deadline.com reported. 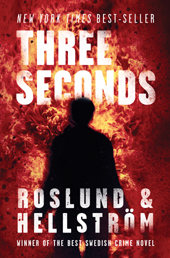 "Hoping for another Girl with the Dragon Tattoo," New Regency has acquired Three Seconds, the fifth novel in a bestselling Swedish crime novel series by Anders Roslund and Bonge Hellstrom, Deadline.com reported, noting that the book "was named Sweden's top crime novel of 2009. The author team is intriguing, considering one's a former journalist, the other an ex-criminal." Three Seconds is published by Sterling's SilverOak imprint. 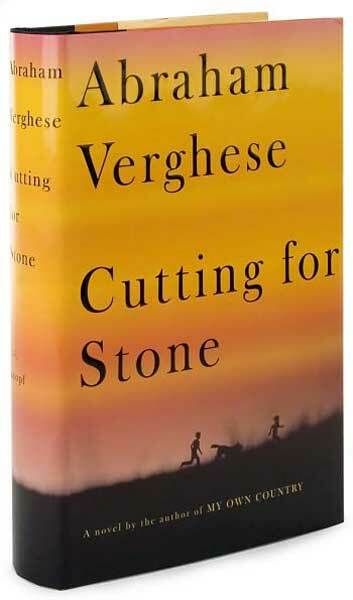 Anonymous Content has optioned the screen rights to Cutting for Stone by Abraham Verghese, according to the Hollywood Reporter. Rosalie Swedlin and Steve Golin will produce the film. "Dr. Verghese's wonderful novel evokes a world so vivid and populated which such rich characters, I knew I wanted to see it come alive on screen," said Swedlin. "It's an incredibly powerful story of family and survival, told in a unique, emotional and truly imaginative way." 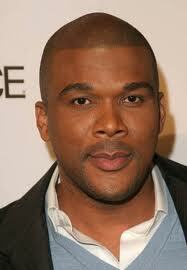 Tyler Perry will play the title role and Rob Cohen will direct a film adaptation of James Patterson's I, Alex Cross, "a reboot of the James Patterson mystery series that starred Morgan Freeman as the detective/psychologist based in D.C.," Deadline.com wrote. The winners in each category receive a $10,000 prize and a year of additional promotion in B&N stores. Second-place finalists take home receive $5,000, with $2,500 going to third-place finalists. The winners will be announced March 2. 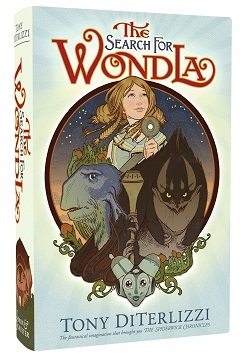 Al Roker's latest pick for the Today Show Book Club for Kids is The Search for WondLa by Toni DiTerlizzi (S&S, $17.99, 9781416983101). This lavishly illustrated chapter book introduces Eva Nine, a 12-year-old raised by a robot named Muthr, who has never seen the world above the surface--until she is driven from their underground Sanctuary by an intruder. Al Roker will interview Tony DiTerlizzi live on the Today Show on Monday, February 21 (President’s Day). More of Ben's art can be seen at benhatke.com and news and updates can be found on his blog at http://letflythecannons.blogspot.com. Three siblings who have been carted from one orphanage to the next learn that they were born to fulfill a prophecy in this page-turning first novel by John Stephens. When the children land in Cambridge Falls, N.Y., the boat master who ferries them across to their new lodgings warns the oldest: "You be careful in that place. You watch out for your brother and sister." Fourteen-year-old Kate, 12-year-old Michael and 11-year-old Emma discover they are the only three charges in this eerie turreted black stone orphanage. In fact, they seem to be the only children in the area. Stephens, who comes from a television background, creates an atmospheric world for Kate, Michael and Emma, bounded by sheer cliffs and plunging waterfalls. 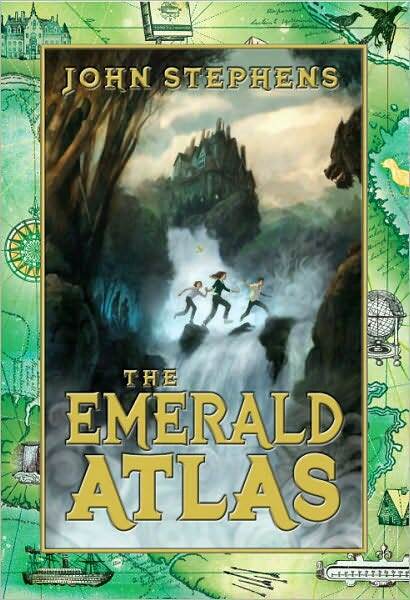 As the siblings explore their new dwelling, a door appears where there was none, and they discover a cave-like room and a green leatherbound volume with blank pages. Michael places a photo in it for safekeeping, which sends the three back to a time 15 years earlier, when a sorceress called the Countess ruled Cambridge Falls. The stunningly beautiful and wicked Countess uses the town's children to blackmail their fathers, whom she's sent to the mines to look for a treasure--the very book that sent the trio into the past. The author endows each of the siblings with strong traits: Kate, the only one of the three with a vague memory of their parents, lives by her wits, and her sole mission is to take care of her brother and sister. Michael's obsession with all things dwarf comes in handy when he and Kate are taken prisoner by an army of dwarves charged with guarding the green leatherbound book (yes, that one, 15 years in the past). Emma may be the youngest, but she displays a great deal of courage. One of the most moving relationships in the book develops between Emma and the giant Gabriel, a descendent of the Anishinaabe people, who live alongside the dwarves in the mountain. Michael's fascination with the dwarves, too, leads to some surprisingly poignant moments. For those who enjoy a good heinous villain, the Countess enlists creatures called morum cadi, or "deathless warriors," which the villagers call "Screechers" for the boneshaking sounds they make. She also keeps a monster on a floating prison offshore, to which she sentences her greatest enemies.